Walmart busts 2 people for trying to steal a tent at its store in Vero Beach. VERO BEACH – 2 people were arrested after trying to steal a tent from the Walmart in Vero Beach, according to the Indian River County Sheriff’s Office. Jody Faye Baughn, 46, and Jason S. Hodgdon, 40, were observed by Walmart’s loss prevention officers as they exiting the store with a $99 tent in their shopping cart. Security video showed Baughn and Hodgedon returning two bull backpacks at customer service without a receipt. Hodgedon leaves the desk and brings back a tent to purchase, but they didn’t have enough money. So they put the tent into a shopping cart and walked out the front door. Deputies made contact with Baughn and Hodgedon. 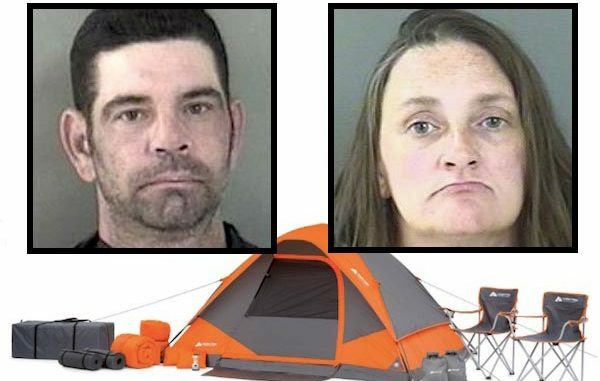 Both stated that they “were taking the tent to Home Depot to borrow $12.00 from a friend” and were going to return to pay for it, the report said. Baughn and Hodgedon were charged with retail theft and transported to the Indian River County Jail.